Ripon Racecourse has introduced a ‘Green Scheme’ in time for the start of the 2019 season, offering discounted entry to cyclists and public transport-users with the aim of reducing the carbon footprint of racedays at Yorkshire’s Garden Racecourse. From the first meeting on Thursday 18th April cyclists will receive a £5 discount token for the Club or Paddock Enclosure when parking up at the bike racks provided. 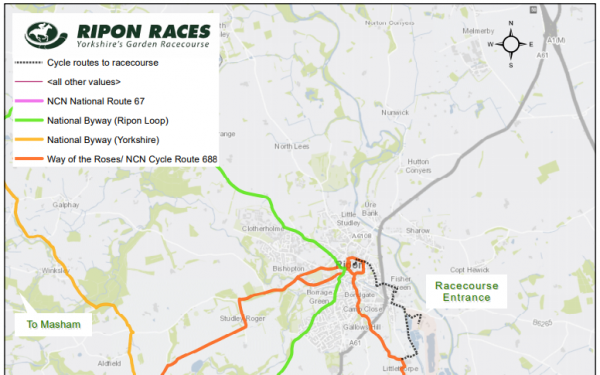 National Cycle Network and Cycle routes to the course, along with full details of how to collect and redeem the discount token, can be found on the Ripon Races website. In addition, a £5 discount will also be given to racegoers who travel to Ripon from Leeds or Harrogate by bus on the raceday, with a shuttle bus also provided by the racecourse from the centre of Ripon to the track. Full details of how to take advantage of this discount can also be found here. Ripon also hosts an Easter Family Day on Thursday 18th April. Alongside a great afternoon of racing there will be an Easter Bunny Hunt, bouncy castle, face painting and mini-farm in the Course Enclosure, as well as free chocolate eggs for kids!